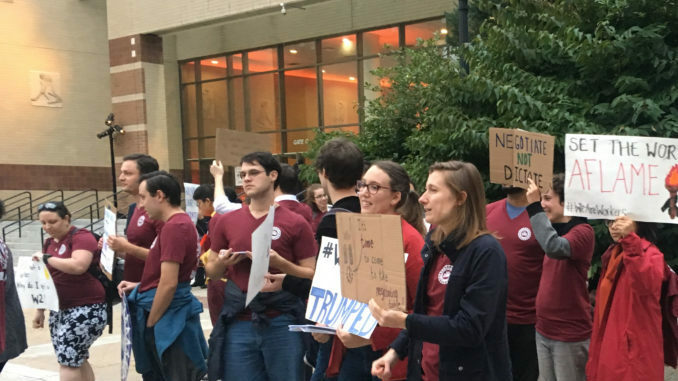 The Boston College Graduate Employees Union (BCGEU-UAW) released a letter on Oct. 31, in which it said that the University had disciplined over a dozen graduate students in response to flyering efforts on Sept. 28. The union and University have since clashed over the matter over which discipline has been handed down. On the night in question, members of the union protested the administration’s refusal to recognize the group by walking out of an address in Robsham Theater by University President Rev. William P. Leahy, S.J., and picketing outside of Pops on the Heights in an attempt to push the union cause to a larger audience—specifically an audience that actively donates to the University. Several members of the BC Police Department and Dean of Students Tom Mogan told the protesters that they could continue to flier as long as they remained within a designated area, which the union agreed to after internal discussions. “And now your administration has opted to unjustly discipline more than a dozen graduate student workers who engaged in peaceful efforts to distribute leaflets and exercise their free speech right to inform the public of the college’s refusal to bargain,” the letter said. On Tuesday, University Communications responded with a statement saying that the punishment was only in response to the walkout, rather than the distribution of leaflets outside of Conte Forum. Members of the union, however, said that there were actually two rounds of discipline: one for the walkout and another for flyering outside of Pops on the Heights. One graduate student who wished to remain anonymous said that the union made a choice to publicize the second round of punishment to push back on what it perceived as an intimidation tactic to suppress worker speech on campus. The administration summoned 16 students to disciplinary hearings for Oct. 24 and Oct. 25, according to union members. Approximately 35 students participated in the picketing and flyering. An administrative warning is “a formal notification to a student documenting that a violation of the Code of Student Conduct has occurred,” according to the Student Code of Conduct. It serves as an official warning to the student that subsequent violations of the Code of Student Conduct may result in higher level sanctions. The notice of disciplinary action cited events that took place on Sept. 28, but did not specify which actions. The case number of the notice matches the case number of the summons that invokes Conte Forum, suggesting a connection between the two.